Photo Credit: Hungry Mother Organics. Thanks to its harsh climate and high altitude, Northern Nevada requires that farmers develop innovate agricultural methods and practice to sustainably grow produce. Seedstock recently spoke with Jacob O’Farrell, Special Projects Coordinator at Hungry Mother Organics about the challenges of farming in the Sierra Nevada foothills and how the state can improve its movement toward sustainable agriculture. How did Hungry Mother Organics begin? We started out as a family farm over 20 years ago in Virginia and relocated to Nevada ten years ago. Thereafter we worked with an inmate rehabilitation program and used prison labor to set up hoop houses at the Northern Nevada Correctional Facility. We continued expanding and eventually launched a retail location where we offer organic produce, heirloom seeds, garden supplies, as well as locally-produced, grass-fed beef, local spices, and locally-roasted coffee. We also work closely with a non-profit organization called FOCUS to provide educational programs and new technology for local food production. How did you decide on the name Hungry Mother Organics? It plays on the idea of feeding Mother Earth, so that she can feed us. Helping to repair the food chain by recycling food waste is a very important part of our business model. How does Hungry Mother Organics make money? 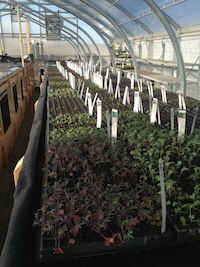 Every spring from April through July we sell a variety of Certified Organic seedlings—tomatoes, lettuce, spinach, peppers, onions, etc. After that, we go into production. We grow out a lot of produce for sale at our farm stand at local farmers markets. We also sell farm-fresh, free-range eggs from our laying flock. We are currently developing a strong retail outlet for our produce in Carson City, focusing on direct retail sales. We sell secondarily to Great Basin Community Food Co-op and other retail outlets. Is there great demand for locally produced food from Northern Nevadans? It’s a growing demand. Every year there seem to be more and more people interested, and they have a growing sense of need to become self-sufficient, or at least somewhat sustainable. A lot of people want to get into sustainable farming, they don’t know how to start. We help with that. Do they have an opinion on Nevada and local food production and how the state could increase its food production in a sustainable manner? Assisting with education and infrastructure. The fact is, Americans have grown to rely on an industrial agriculture that produces cheap food, making it difficult for any small-farming operation to become profitable. The single greatest challenge to local food production is that no matter how high the quality of your product is, you’re still competing with mass-produced industrial food. The only way to truly change the game is to change the food economy at a fundamental level, increasing the access to information about where people’s food comes from. There’s a lot of land in Nevada, it’s just undeveloped. We have to temper natural climate to make it hospitable, for example, setting up hoop houses to extend the growing season. We could increase food production if people were able to learn more about the methods for growing in our unique area. What are some challenges to growing in your region? We are in the foothills in the Sierra Nevada Mountains half an hour from Lake Tahoe. It is a high desert atmosphere with a very short growing season. Although we have 300 days of sunshine, we don’t get past last frost until the end of June. You have to deal with large temperature fluctuations and at the same time being at 4,500 feet. The intensity of the sun is higher at this altitude. In the summertime we have to use shade cloths and structures to make it hospitable. For tomatoes it requires protection from the elements. Soils can also be a major factor. Many of the soils in Nevada are either sandy soils low in nutrients or soils high in pH, sodium, and soluble salts. We have to add a lot of organic material and other cultural practices to make it conducive to plant growth. Some of these issues can be addressed by indoor agriculture using soilless mediums. That sounds challenging; are there any benefits to growing in this region? That’s a tough one. We have 300 plus days of sun, so as far as natural lighting, we’re well equipped. Thus, it is certainly a good place to experiment with high tunnel and greenhouse agriculture. We have an alkaline soil, so brassicas such as kale, cabbage, and broccoli do well here. We have good water resources, but still there’s a water scarcity. What are your thoughts on hydroponic and aquaponic farming? Just this year, we’ve gotten into aquaponics. Hydroponics, while it has a lot of potential, is not a truly sustainable growing method. It requires artificial inputs, which are petroleum based and use fossil fuels. At the same time, you have to burn energy for light and heat systems and pumps. We are investigating aquaponics because the nutrient source—fish and worms—is sustainable. What else would you like people to know about Hungry Mother Organics? We are trying to promote the use of sustainable farming methods in areas where they would not normally work, particularly the high desert. This past October, we received a federal state marketing improvement grant to promote sustainable agriculture within the Spanish-speaking community. Additionally, we offer classes and seminars to educate our community. In the past, we have offered seminars on beekeeping, building a passive solar cold frame, children’s gardening classes, and vegetable container gardening.